When I first started practicing energy medicine in 2007, I was still working fulltime in engineering. I came to the practice as a way to help myself, but I didn’t want anyone at my work, a pretty conservative environment, to know that I was venturing into woo-woo land so I kept it a secret for a long time. I worried that they’d think, as my husband (an engineer) did at the time, that I was losing it (my mind). Maybe I was losing my mind, but all I knew was that I desperately needed to help myself. I’d been in the ER seven times over the span of about 14 months, fallen down my stairs (hardwood, from the very top), and had a serious car accident that shut down all northbound lanes of I-5 during Seattle’s rush hour traffic. I’d been avoiding a diagnosis for Lupus and other serious illnesses and declining medications. It was when I asked my doctor for a referral for a “natural” doctor (I didn’t know what to call it) that he suggested an integrative doctor. The integrative doctor, (an MD), urged me to “make a change” and that the car accident was perhaps my last “sign” — a warning from the Universe. She even suggested that I practice energy medicine myself. I said, “What? Why? Who? Huh?” But I did what she said and entered into a mentoring program where I learned words to match what I was feeling. I started working as a practitioner and eventually left my engineering job. Lots of details behind my journey, but sharing that is maybe for another day. Today, I want to emphasize the power of energy work. I’m sharing my story here, now, because I think my experience is a common scenario. So many people are struggling to maintain their health, happiness and sense of wellbeing while juggling work, family and other responsibilities. People think they need to quit their jobs in search of wholeness. This isn’t necessarily true. Sometimes it is, but not always. It took me a long time to figure out that I didn’t need to leave my job to find my health. What I needed was a set of tools to manage the stress in my life — personally and professionally. It’s been eight years since I left my job and I still grieve “what could have been” and I miss collaborating with my peers and working in a team to solve problems. Like so many, I scratched, clawed and dug my way to create something out of nothing. And I walked away from it because I was not healthy. I really do believe you can “have it all” as they say, but it requires discipline, determination and dedication: three things I work on every day now as a writer and something I imagine I’ll do till the day I die. An important lesson I’ve learned is that we need to help each other. One way I choose to help is sharing what has helped me. And part of my wellbeing plan includes energy healing; being on the receiving end. One of the reasons people have a hard time embracing energy healing is because it isn’t tangible or measurable, seemingly. BUT, it actually is. 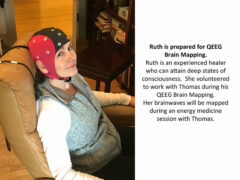 Earlier this year, I volunteered to have my brain mapped before and during an energy healing session with Dr. Thomas Beck, a gifted healer here in Seattle. Below are a few of the images and results. 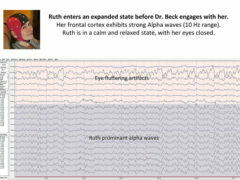 Check out Dr. Beck’s website for even more dramatic examples. Interesting Ruthie. You are such a disciplined person, do you suppose that makes it easier to do this? What do the charts mean? Is this like many steps past meditation? Sorry you have regrets leaving your past when you could have had it all, but without that you may not have discovered this or worse something may have happened to you as I am sure this state Isnt learned quickly. I am happy you have found balance and serenity, that in itself is an amazing journey. Ditto what Susan said. Had you not left when you did, (even though you were missed by many), you might not be where you are today. Hi Susan and Brian, and thanks for the comments. I do feel torn at times about leaving my job in engineering and I believe it’s people like the two of you that I miss the most. Working solo feels lonely at times, but I am slowly building a community. Bill and I attend the networking/social events a few times a year too so that’s a great way to stay connected to everyone. As far as the altered states/charts go: I guess going into higher states is something I’ve done my whole life without having the understanding of what’s happening. I started seeing a therapist who specializes in the spiritual side of things two years ago and she’s helped me put words with what I am experiencing. Also, going through the enrgy medicine training and then the meditation and yoga teacher training starting about ten years ago opened up the flood gates! Which is about when I started “falling apart” and finally left D3/LMI. 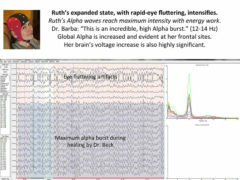 The significant thing about the qEEG / brain mapping was to show the effects of energy medicine. I have complete trust and belief in the work and am helping to demonstrate its credibility. If you want to talk about it more, let’s get on the phone. I am happy to share anything and all things.